Buzzers, people always find a creative yet funny words to express themselves and their dissatisfaction about politics and certain events such as Brexit! We still remember how the idea break the heart of the people of Britain. The anti Brexit campaign was held to rethink the decision. 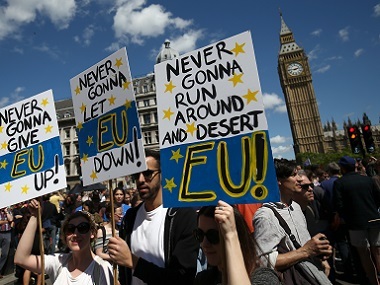 People go out in the streets to show how they love to remain in European Union with funniest puns of Anti-Brexit signs!! #5. True dat…one day you’ll get f*ck*d up too..
#8. She needs to date more.. Previous article These 20 Funny Pictures During Flood Are A Proof That You Can Choose "Happiness"
Next article TOP 20 Funniest Dad Text On Twitter You Should See!